I recently noticed that one of the vampire bats that died in 2010 at the Organization for Bat Conservation was the oldest vampire on record, at about 30 years old. Bats live 3.5 times longer than they should for their size. The average max lifespan of a bat is 17 years. For comparison, the oldest mouse ever was 4 years old, and the methusaleh of rats was 7. The oldest bat reported was at least 41 years old!! That is just ridiculous for a small mammal. This bat could be 40 years old. Born at the Chicago Brookfield Zoo, this vampire bat passed away at the age of 29.9 years. That’s a long time, even for a bat. 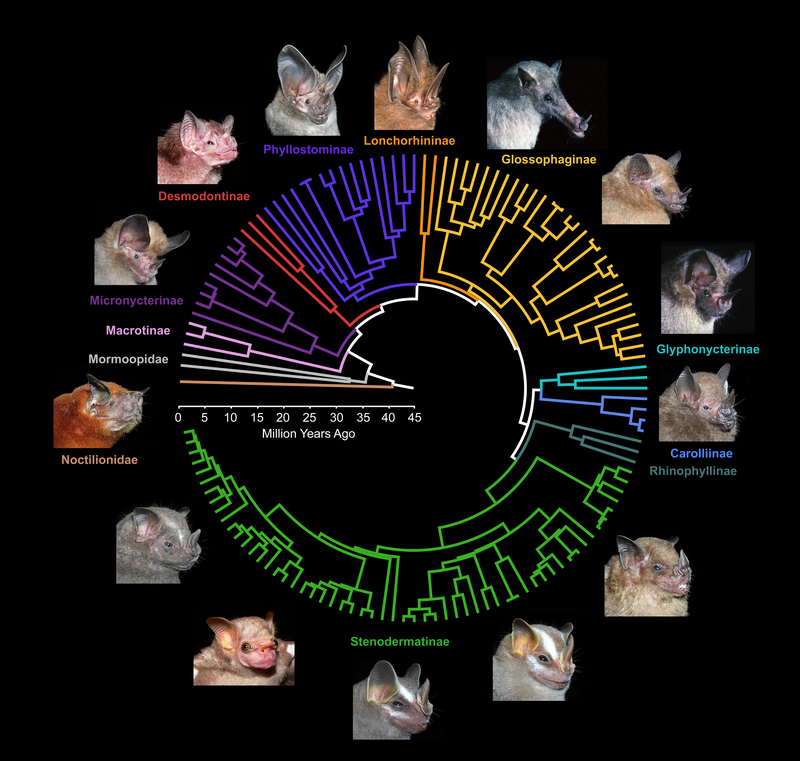 Out of records of lifespan in about 90 bat species, there are only 6 known to live longer. These are the large flying fox, Pteropus giganteus (max age=40 years), the horseshoe bat Rhinolophus ferrumequinum (30.5 years), and three insect-eating bats in the family Vespertilionidae: Plecotus auritus (30 years), Myotis blythii (33 years), lucifugus (34 years), and M. brandti (41 years). 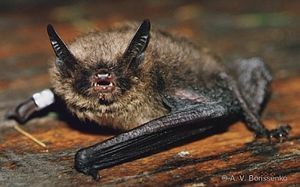 Vampire bats are the longest-living, non-hibernating microbat (i.e. not a flying fox). And they are the longest-living bats in their family– the neotropical leaf-nosed bats, the Phyllostomidae, which is also the most ecologically diverse family of bats. Several factors are correlated with long lifespan in bats– reproductive rate, size, and hibernation. Big animals tend to live longer (one obvious reason is that it takes time to get big, and we all start the same size: one cell.). And hibernation seems to slow down your aging too (more about that later). All of the longest-living bats are either big flying foxes or small hibernators. Vampire bats are the exception; they are small but don’t hibernate and they live a long time. If you control for the known predictors of lifespan (size, latitude, reproductive rate, and hibernation), you get a spread of residuals for longevity (showing the variation not explained by these factors). For bats, those residuals look like this (below). The outliers are labeled as dots. So why does the common vampire live so long? One reason is that vampire bats are very slow reproducers, even for having at the most only one offspring a year, like most bats. For example, they have the longest gestation period (about 6.5 months), and they provide substantial care for their offspring for at least a year. Vampire bats compensate in part by being in a reproductive state almost constantly; there is no breeding season for vampires (like humans). But they are still slow reproducers. Organisms vary in the extent to which their bodies invest in growth vs maintenance. You can have lots of babies by living fast and dying young (like a petunia ). Or you can take it slow, build up your strength and endure (like an oak tree). Vampire bats invest a lot in their one offspring. Among bats, they are oak trees… metaphorically. Your parents were right when your goldfish died and they told you, “dying is an inherent part of life.” Your cells are dying constantly, and every time you eat, breathe, or exercise, all the healthy things they tell you to do– that produces oxidants that damage your DNA. Your body produces antioxidants to protect the DNA. One theory of aging is that some animals live longer because they are better at protecting their DNA from this kind of damage. 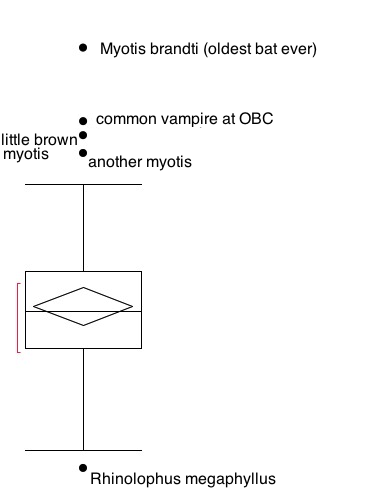 In fact, one study found that vampire bat DNA was more protected from damage than another bat species Myotis velifer. So that could be another reason. However, this mechanism has been appearing less and less important as research on aging continues, with more attention being paid to the insulin IGF-1 pathway. But this has never been investigated in bats. One interesting finding, which has been replicated many times, is that if you fast animals, they live longer. This is called caloric restriction, and its effect on age has been studied experimentally in many things from yeast to flatworms to dogs and primates. Some have proposed that hibernation prolongs life for the same reason as caloric restriction. There is also some evidence that you can prolong lifespan by giving the same amount of calories but in big chunks spaced apart, where you only feed an animal every other day, or every 24 hours. Interestingly, this is the way vampire bats eat all the time: one big meal every 24 hours. Blood is also a strange food. Minus all the water, its 93% protein, 1% carbs, and 1% fat. Maybe this weird diet and the every-other-day feeding regime are other reasons vampires live so long. Aging is one of the hottest topics in biology right now. As mechanisms of aging are better understood and we have more data on maximum lifespan of bats and other animals, we will be able to throw out more of the ideas above. One of my favorite theories of why caloric restriction prolongs aging is based on an evolutionary theory that states that you can increase your reproductive success even when having fewer offspring. Wait- what?? How’s that possible given that reproductive success = number of offspring you produce?? As shown in this brilliant paper, in a population that is shrinking, you can increase the proportion of your genetic contribution to the next generation if you procrastinate having your offspring till a bit later. To take an extreme example: in a population dropping from 20 to 10, your offspring, if born later, will be 1/10th rather than 1/20th of the entire population. During a population increase, it’s best to reproduce sooner rather than later, but during a population crash, natural selection will rewards those that delay reproduction. So if there are cues of a population crash, like a famine, an organism’s body might shift from more like a “petunia” to a more like an “oak tree”. Is there any evidence of this? Well, there is one finding that’s hard to explain using other theories: just smelling food can partially reverses the effects of caloric restriction. Wow, crazy.